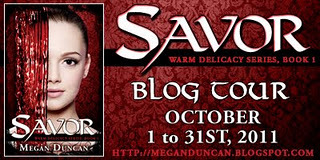 I was all too happy to join the blog tour for Savor, having read and enjoyed Megan Duncan's first book, Released. But I have to say, I loved Savor much more than Released! 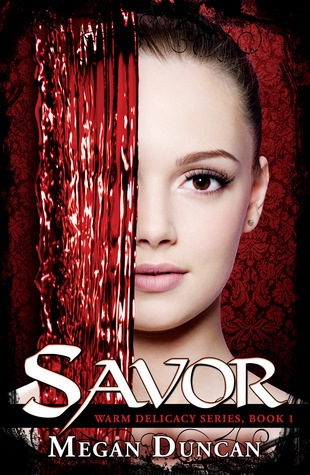 I haven't read any vampire books lately, and so I jumped into Savor with a clean slate and was thoroughly surprised. Megan Duncan's writing style has vastly improved from Released, transforming from 'good' to great! Her prose flowed nicely, and Claire's narration was distinctly hers. Plus, the vampire world that Megan has created is really different than most vampire books I've read. It's a bit reminiscent of the Morganville Vampires series, but the comparison is relatively small. I do think that fans of the Morganville Vampires series will enjoy Savor quite a bit. There were a lot of great characters in Savor. Claire was faced with the difficult decision of whether or not she would become the new vampire princess, and eventually inherit the throne from the King and the Queen. At first, she agonized over the issue, but then, too quickly in my opinion, she came to terms with it. She made a complete and total life-altering decision, which uprooted her from her old life and threw her into a strange new one, and I felt as though she settled into her new life much too quickly. That was really the only thing that bugged me about Claire, that she could so easily forget her old life, and the people she loved. But other than that, she was a strong girl, who didn't back down from a challenge, and handled everything with maturity and rationality. Robin, a vampire girl around her age that she meets at the royal palace, and becomes best friends with, was also a really great character. She was funny and I could tell that she really cared for Claire. She added a bit of spice to some of the scenes. There was a dash of insta-love, but it wasn't too bad. Claire meets Dmitry, a very handsome vampire that lives in the palace, and their connection gradually builds from the first day they meet. Claire and Dmitry are a sweet couple, I just wish their relationship had more time to grow. Towards the end, there was major hinting of a love triangle, but the book ended before that could be built upon more, so I guess I'll just have to wait for the sequel. Speaking of the ending, that was one of the two thing that I really just didn't like. It ended in a place that felt like the middle of the plot. I feel like there should have been just a bit more story added to the end, with more explanation of what was going on, because the last 10 pages or so really threw me for a loop. There was a major explanation that's important for the whole series, but it was so abrupt that I couldn't even fully digest and understand it. There's always the sequel, which is great, so the ending isn't too bad because even though it left off in a weird place, the story will continue. The other thing (or things) that I didn't like were Ana and Luke, who were two vampires that lived in the palace and hated Claire with a passion because she "stole Ana's throne", which Claire didn't, not really. Their evilness was a bit too campy, especially Ana. Sometimes subtly is a million times more menacing than outright disdain, and Ana definitely could've used some menacing subtly. On the whole, though, I really did enjoy Savor very much. Whatever problems I had with it are minor details in the grand scheme of the whole novel, which I thought was well written and unique. I can't wait to get my hands on the sequel! I give this novel 4 out of 5 stars. I have 2 prizes up for grabs today to 2 lucky winners! If you were chosen to be a vampire princess/prince, would you accept? --- In a heartbeat! Thanks for the great giveaway! I'd definitely want to be a vampire princess! Being a human's boring. I like your review! Not sure if I'll like it that much since I don't really like insta-love, but I'm willing to give it a try. Yes, I would. Most definitely. Probably, but it would depend on the circumstances. LOL Thank you for the giveaway!! Sure, it could be fun! Yeah, it may be fun.